AMID the struggling economy, the local industrial property market seems to fare better than office and residential properties although industry players expect the market for this asset class to remain flattish this year. They concur that the current slowdown in manufacturing orders has not impacted industrial property as tenancy contracts for industrial property are locked in for a longer period of between five and 10 years compared with two to three years for office space. They say these long-term tenancy commitments reduce any panic selling or “irrational transactions”, thus sustaining the prices and rental rates of these properties. This property sector has remained relatively resilient because landlords are more willing to work out “win-win” solutions with their tenants during the current difficult times and tenants are allowed to pay up when business conditions recover. “Landlords are more inclined to help roll-over rentals because capital expenditure (capex) for signing up new tenants is quite high,” an analyst from Kenanga Research tells StarBizWeek. The reason for this is that industrial property space is usually tailored for specific tenants and any changes in tenancy will incur additional costs of construction and renovation. 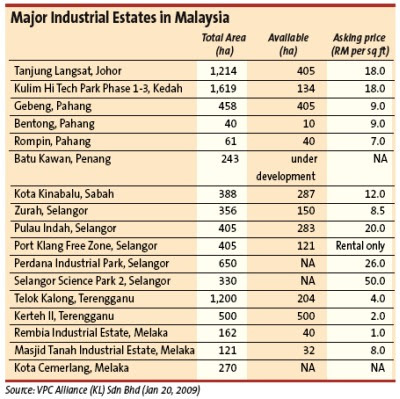 The gross yield for industrial property is around 7% to 13%, with rental rates averaging at between 80 sen and RM1.75 per sq ft.
Association of Valuers and Property Consultants in Private Practice Malaysia (PEPS) president James Wong, who thinks the impact of the global financial crisis has not been fully felt yet, says industrial property prices are stable and have not declined. “We foresee that there will be a slight drop in prices, demand will be weakened and new launches of industrial property are likely to be deferred until confidence returns to the market. “The volume of transactions of industrial properties will also contract. Although the industrial property market in the Klang Valley is expected to be the most resilient, a mild drop in prices seems inevitable,” he tells StarBizWeek, adding that the property market for next year will fare worse than this year. “By then, quite a number of manufacturing companies will close down and go into receivership. This will result in forced sale by the banks, which will bring down industrial property value further,” he says. Manufacturing output has fallen from a year ago. In January, exports plunged 28% to RM38.3bil from a year ago, while imports fell by 32% to RM29.5bil. Wong adds that unlike the Asian financial crisis in 1997/98 period, the global slowdown is expected to prolong. “We do not foresee a recovery in the industrial property market before 2010,” he says. The industrial property sub-sector is a relatively small sector in the property market. In 2008, there were 8,126 transactions worth RM7.9mil out of a total 340,240 transactions worth RM88.34bil. In tandem with the economic slowdown, the unsold units in the industrial market sub-sector increased by 30.7% to 2037 units last year compared with 1557 units in 2007. Penang is the most affected as demand has dropped by over 50% in core industries such as electrical and electronics, plastics and metal. “The performance of the industrial property market will depend on the performance of the manufacturing sector,” he says. Wong suggests seeking new export markets as one of the ways to boost industrial property such as the Asean-Australia-new Zealand Free Trade Agreement. Others include setting up small and medium-scale industrial parks with subsidised grants, hi-tech and science parks. International Real Estate Federation vice-president for marketing and networking Michael Geh expects demand for industrial property to start rising after the first quarter of next year. Reapfield Properties Sdn Bhd president David Ong says it will be a great challenge for the industrial sector going forward as there is a possibility of some factories ceasing operations due to drop in demand for their products. Hall Chadwick Asia Sdn Bhd chairman Kumar Tharmalingam says if the economy does not improve, he expects industrial property to feel the impact by the fourth quarter this year. However, he says factories have not closed down yet although they are laying off workers. “The situation is not clear but I understand banks have not foreclosed any property yet because a lot of factories and businesses are still paying their rentals,” he says, pointing out that the Government’s stimulus plan is to make sure factories will not shut down. Colliers International Property Consultants managing director Teik Bin Teh says demand for industrial property is on the decline but the exact number is unclear. “Prices have not dropped because there is no transaction. We are unable to judge the price trends with only a few transactions. But prices are certainly not going up,” he says, adding that there is no oversupply of industrial properties because not many new industrial estates have been developed in the past five to six years. 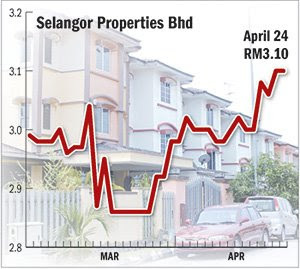 SELANGOR Properties Bhd (SPB), one of the largest landowners in Damansara Heights, Kuala Lumpur, expects to beat last year's revenue, driven by property sales in Claremont, Australia. SPB, in which the Employees Provident Fund holds a 3.7 per cent interest, made a net profit of RM118.6 million on revenue of 210.6 million for its fiscal year ended October 31 last year. The company is redeveloping a retail centre in Claremont. It is building 82 apartment units in two phases for A$69 million (A$1 = RM2.57), and a 300,000 sq ft retail mall worth A$174 million. The apartments have been fully sold, and A$41.2 million, being the first phase of the development, will be recognised this year, financial controller Lee Boon Kian said. Lee said the second phase, worth A$27.8 million, will be recognised in 2011. "I don't think we can match our profits for last year, which was partly contributed by foreign exchange and exceptional gains. But we will be profitable this year, and expect revenue to do better," he said after the company's shareholders meeting in Kuala Lumpur yesterday. The company also aims to sell a total of 270 houses, priced from RM280,000 to over RM400,000 per unit, within its RM400 mil-lion Bukit Permata mixed deve-lopment in Gombak, Kuala Lumpur, before embarking on new projects. These are unsold stocks that the company has been unable to sell since its launch in early 2008, Lee said. "We used to sell 20-30 units a month, but due to the current economic climate, we are only able to sell half of that," Lee said. Its pipeline projects include a new phase within its ongoing RM350 million Selayang Mulia residential project in Selayang. It is also planning a mix housing development on a 55.6ha in Ulu Langat, Selangor, featuring two-storey terraced houses and semi-detached homes. In Damansara Heights, SPB will construct a condominium block at Jalan Batai, comprising 107 units, each priced from RM1 million; and office and condominium towers at Jalan Semantan. "The launches will depend on the market, which is still very cloudy. The projects are on the drawing board. We are waiting for approval," he added. Meanwhile, Lee ruled out the company is being taken private by its major shareholders. It’s time to have consistent bumiputra housing quota policy nationwide. The Government’s decision to scrap the 30% bumiputra equity requirement for 27 services sub-sectors is a step in the right direction to raise Malaysia’s competitiveness in the global business front. But in order to bring back the spotlight on the country as the place to do business and to attract more foreign direct investment (FDI), there should be proper follow through to unshackle the mantle of protectionism in the other economic sectors and create a more level playing field. One area is the property industry. The world is certainly going through very troubled times and we have to gather all our resolve and resources to ensure the country is favourably positioned for a comeback when the global economy finally recovers. Despite some signs of economic stability due to stimulus measures undertaken by the authorities, the International Monetary Fund sees long months of economic distress before the world economy recovers in the first half of next year. Having lost much wealth and resources to the global financial crisis, countries worldwide will be desperately seeking to rebuild their strengths and sharpen their competitiveness to make a quick comeback when the world economy shows any signs of a recovery. In order not to be left behind, Malaysia has much to catch up with the rest of the countries, including those in the region such as Vietnam, Thailand and Indonesia, which are making big strides in their competitive rankings. To ensure a more competitive playing field for our local businesses and foreign investors, all the stifling rules and guidelines that affect the efficiency and competitive edge of businesses and industry groups should be removed eventually. Given its link to the other 160 industry sub-sectors, the property industry has a huge role to play to breathe more life and activities in the local economy. But it also one of the most regulated industries and is made to fulfil various socio-economic objectives. The local property industry is one of the most impacted by the global financial crisis as the people’s confidence in the state of the economy and their well-being nosedived since the middle of last year. With plunging property sales and having to slow down or defer their projects, developers are bracing for tougher days ahead and do not want to be further burdened by some of these practices. While the national housing policy should help all needy Malaysians to own their own homes, and if the bumiputra housing quota has to be continued, it should be streamlined so that there will be a consistent one across all the states in Malaysia. Both the Federal and state governments should work together to streamline and have a consistent policy and implementation across the country. Without clearer and more consistent implementation of the bumiputra quota policy, it will be hard for developers to continue their projects successfully and offer their best to buyers. At present, the quota for bumiputra buyers ranges between 30% and 70% of the number of houses built, while price discounts for bumiputra buyers vary between 5% and 15%. Although most states adhere to a 30% quota, it is 40% in Johor, while in some suburbs in Selangor such as Shah Alam, it is between 50% and 70%. Industry players want the quota to be standardised at 30% while discounts for bumiputra buyers should be capped at 5% and should only be applicable for houses priced at RM250,000 and below. Buyers of houses that are priced higher than that are more financially secure and do not need such discounts. An automatic bumiputra quota release mechanism that is standardised and transparent should also be in place. There should be an automatic release of the quota units after six months of a project’s launch or when a project has reached 50% of construction. As property remains one of the most viable investment instruments around, there is huge potential to be tapped from raising Malaysia’s profile and competitiveness as a property investment hub. To attract more foreigners to invest in Malaysian real estate, more consistent policies to attract FDIs should be implemented. Developers lament that the policies in the various states contradict the Federal Government’s initiatives to attract foreign investors. The abolishment of Foreign Investment Committee approval for foreigners purchasing properties priced at more than RM250,000 and the exemption of property gain tax on sale by foreigners reflect the Government’s initiative to promote FDI in real estate. However, state governments still impose their own rules on foreign property sales and purchase. Such foreign quota restrictions make it hard for developers to sell properties to foreign buyers. While more enabling and liberalising measures by the Federal Government are expected to be announced soon, the success of such measures, especially those pertaining to land matters that come under the purview of the state governments, is dependent on the willingness and efficient implementation by all involved. ● Deputy news editor Angie Ng believes that regardless of the good or bad times, much more can be achieved when all Malaysians unite and forge ahead as one. PK RESOURCES Bhd is investing RM58 million to build a four-star hotel adjacent to the Nilai Springs Golf & Country Club in Putra Nilai, Nilai Springs Resort Sdn Bhd general manager G.K. How said yesterday. Construction of the nine-storey 183-room Nilai Springs Resort Hotel was progressing smoothly since last year and was nearing completion. "According to our plan, we are to do the soft launch on June 8. The hotel is slated to start full commercial operations in September," he said. How said the hotel would have the "Azuma Fusion Restaurant" serving a variety of Japanese, South Korean and Chinese food and western food by "Springs Cafe". The stall-styled "Golfers' Terrace" will serve local cuisines. There are also "Fairway Lounge" and "Splash Station. "For the next two years, our occupancy projection is 55 and 60 per cent. We are confident of achieving this target as the hotel has only 183 rooms. "In fact, we have already received bookings from several F1 racing teams coming for the F1 championship at the Sepang International Circuit next year. The optimism to woo hotel guests stems from the hotel's strategic location proximity to the KL International Airport in Sepang, Low-Cost Carrier Terminal, Sepang International Circuit, Cyberjaya Intelligent City and Putrajaya federal government administra-tion centre. PK Resources (formerly known as (Peladang Kimia Bhd), a property developer, is currently focusing on Putra Nilai (new name for Bandar Baru Nilai) township via its wholly-owned subsidiary BBN Development Sdn Bhd. Putra Nilai is one of the largest townships within the Multimedia Super Corridor and is strategically located in the vicinity of the Kuala Lumpur International Airport, Putrajaya and Cyberjaya. MAIN board-listed EcoFirst Consolidated Bhd, which is undergoing a corporate restructuring exercise, is eyeing various mid-sized projects worth over RM200mil. Executive director and group chief executive officer Tiong Kwing Hee says the group is in advanced talks on construction work for a new hospital and an educational institution. “We are awaiting approval from the relevant bodies and expect to conclude both deals by next year,” he tells StarBizWeek after the official launch of Edu Mall @ South City yesterday. As part of its turnaround plan, the group has rebranded its key property asset South City Plaza in Seri Kembangan to an educational mall with a view to increasing its occupancy rate to 90% by year-end from 75% now. Tiong says the group hopes to raise about RM80mil to RM100mil through the issuance of sukuk bonds by year-end to finance the building of two high rise buildings on top of the mall as well as the mall’s refurbishment. To reform its business model, the group has identified food ration and manufacturing as new income generating divisions. “We plan to invest about RM40mil to RM50mil to acquire two manufacturing companies by the middle of next year and have identified three potential candidates. “We are also currently negotiating for a long-term food ration supply contract. We anticipate an average additional income of RM3mil per annum from both divisions,” says Tiong. Meanwhile, the group is also looking to establish a 50:50 joint venture in engineering, procurement, construction and commissioning (EPCC) under its construction division. “We are talking to some government agencies to do EPCC work for government ports,” says Tiong. To date, the group has completed about 60% of its total government contracts worth some RM70mil. “We hope to return to the black after the restructuring exercise is completed by the middle of next year,” says Tiong. EcoFirst currently operates four divisions – property investment, network marketing, construction and education.